Location: University of California, Santa Barbara – Santa Barbara, Calif.
Campus Snapshot: The UC Santa Barbara campus is bordered on three sides by the Pacific Ocean, has miles of coastline, its own lagoon, and a rocky extension, known as Campus Point. Founded in 1909, the university is a part of the University of California system and according to U.S. News and World Report it is one of the top 15 public universities in the United States. The Greek community has over 8% of the 19,000 undergraduate population. Chapter Profile: The Kappa Eta Chapter, number 214, was originally founded in 1983 as one of the earliest fraternities founded at UCSB. In 2008, the chapter was closed. Since refounding, the colony consistently worked to bring pride and dedication to everything they were involved in, including community service, philanthropic events, intramurals, scholarship, and brotherhood. On January 25, 2014, the Kappa Eta Chapter was rechartered, initiating 31 knights as refounding fathers with a total manpower of 75 after the most recent recruitment. 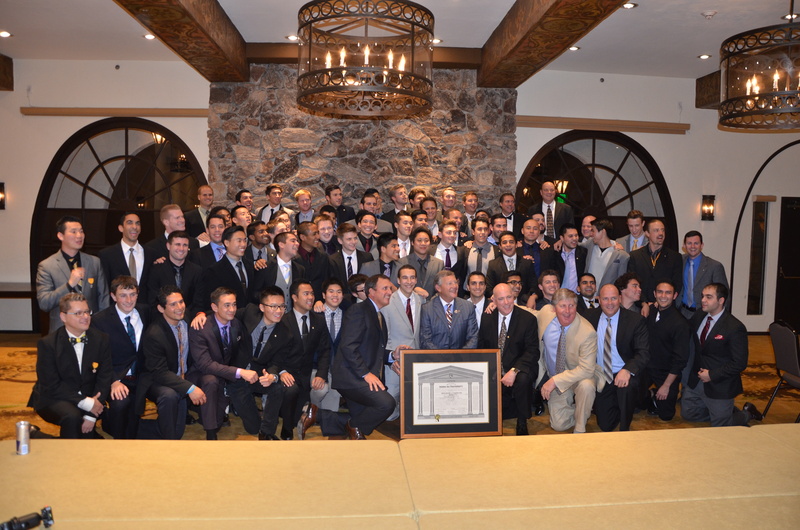 The chartering was a successful event with nearly 175 people in attendance, including some of the original founding fathers from 1983. Also in attendance were Regent Charlie Eitel, Past Regent and Chairman of the Sigma Nu Educational Foundation Joe Gilman, and Grand Historian Bob McCully. The Kappa Eta Chapter would like to recognize Robert Moody and the Kappa Eta Alumni Advisory Board for pledging their support to Sigma Nu at UC Santa Barbara. The chapter would also like to give a very special thanks to the rest of the alumni, parents, university staff and advisors, the Sigma Nu staff, as well as Regent Charlie Eitel and the High Council for helping to make the Kappa Eta rechartering a success. Location: University of Oklahoma – Norman, Okla.
Campus Snapshot: The University of Oklahoma campus is located in Norman, Okla., just south of the state capitol. Founded in 1890, the university has grown to over 20,000 undergraduates and a Greek community representing almost 25% of the student population. Chapter Profile: The Delta Epsilon Chapter, number 75, was originally founded in 1909. In 2010, the chapter was closed. Since refounding, the colony consistently worked to bring pride and dedication to everything they were involved in, including community service, philanthropic events, intramurals, scholarship, and brotherhood. 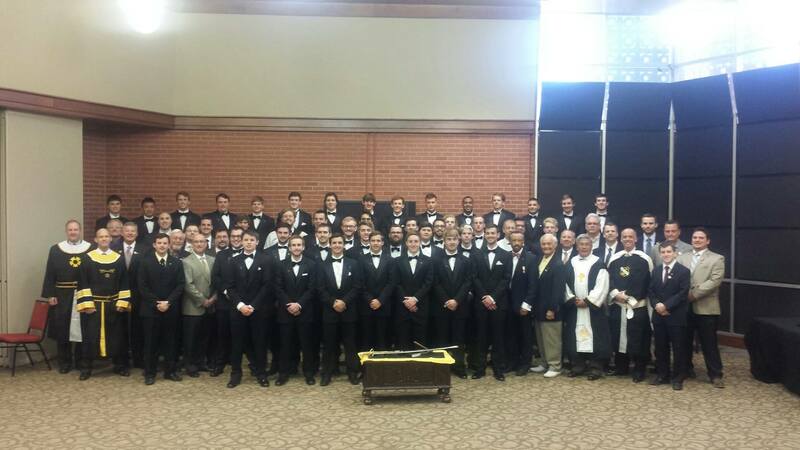 On April 12, 2014, after working diligently for 18 months, the Delta Epsilon Chapter was rechartered, initiating 44 knights as refounding fathers. The chartering was a very successful event with nearly 200 people in attendance, including Regent Charlie Eitel and Regent Elect Joe Francis. The Delta Epsilon Chapter would like to recognize all the alumni who have stepped forward to serve on the Delta Epsilon Alumni Advisory Board, House Corporation, building committee and campaign committee, and for pledging their support to Sigma Nu at Oklahoma. Much of the chapter’s success is built upon a solid foundation set by these alumni leaders. The chapter would also like to give a very special thanks to the rest of the alumni, parents, university staff and advisors, the Sigma Nu staff, as well as Regent Charlie Eitel and the High Council for helping to make the Delta Epsilon chartering a success.